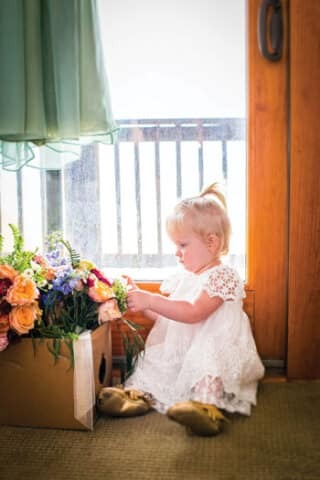 Kids in weddings: Children can add so much more to a dream wedding than just their usual roles as flower girls or ring bearers. 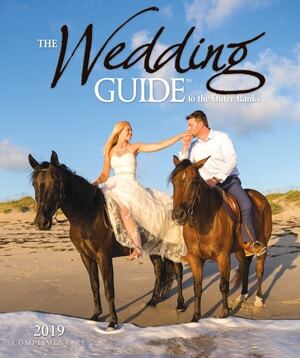 Their youthful ebullience and appreciation for time-honored rituals make them naturals as participants in a beautiful wedding ceremony and reception. There are numerous ways young ones can be included in the celebrations that can enhance their sense of belonging and the couple’s joy in sharing with family and friends. For brides and grooms who prefer a solemn occasion, it might be best for guests to leave the kids with a sitter. Other couples may just want to party without worrying about the youngsters and plan an “adults only” celebration. Some may prefer the option of sponsoring childcare at a separate location concurrent with the wedding events. But many couples enjoy having children participate, especially in the actual wedding ceremony. And the kids are usually thrilled to be treated as a special part of the ritual. We are all familiar with the dedicated ‘kids’ table at the reception. Sometimes, even with a children’s table, coordinators say that there is no guarantee that some kids will not get bored or become restless. That’s why it is always a good idea to plan some form of childcare at the reception to keep the youngsters engaged rather than tugging on the adults’ legs. The babysitter’s table should be fortified with games and entertaining activities, but there should also be a sitter hired to keep an eye on them. However, do not be surprised to see that the younger children – under 4 years or so – may still want to stay close to their parents during the reception. The reality is that younger children will often have more fun if a professional is hired to plan post-ceremony children’s activities that will focus on their own enjoyment. By not expecting the junior bridesmaid or ring bearer to also put on their best behavior for every wedding event, you will ensure more relaxed fun for all guests. He continues, “We plan to do kids first, because they don’t last.” When the ceremony is at the beach, it can make the photographer’s job even tougher as children tend to be especially distracted by the waves, birds and open spaces. 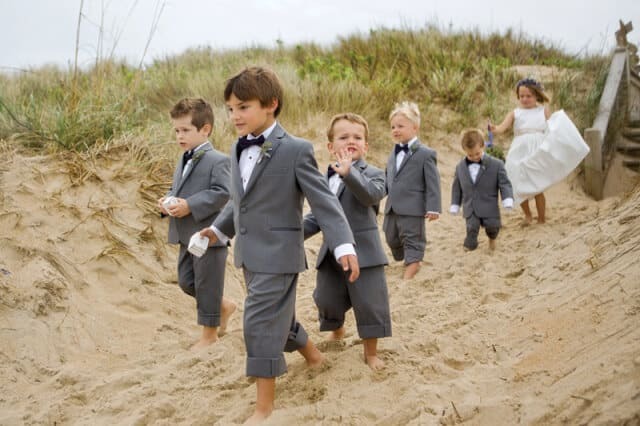 Consider using the beach as part of your prop and photograph all the children in wedding attire putting the finishing touches on a sand castle together. 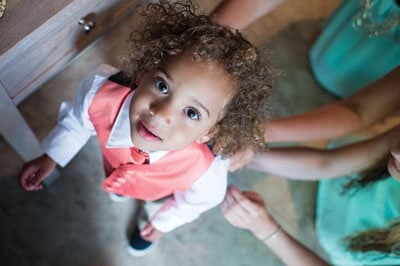 When it comes to a second marriage, there are some things to consider when deciding how to include children in the ceremony. Some officiants will let the children of a newly blended family sign the marriage license as a gesture. However, it’s hard to always anticipate how a child will react. Before giving children any significant roles in the ceremony, it is important to be sensitive to how they are handling the news of their parent getting re-married. One unexpected outburst occurred when a groom’s son was asked for his “I do” during a part of the ceremony. “But you’re not my mother,” was his response picked up during the videographer’s filming of the vows. Looking for a way to introduce sons, daughters, nieces, and nephews from both sides of the family to try on their new role as extended family members? Involve them in different roles to assist at the ceremony and reception. A few tasks for children include handing out programs, assisting with the guest book, and seating guests. One creative couple appointed their youngest family members as junior photographers after the professional was finished taking her posed photographs. The couple was delighted to find out that they ended up with a few more spontaneous shots of their guests having fun at the reception – and from very different angles! Local ministers and officiants can help you avoid the flower girl/ring bearer cliché while adding children to a new, blended family with sensitivity. One symbolic way to include the entire family is to expand the traditional unity candle ceremony. Instead of having only bride and groom taper candles on the altar, additional taper candles are provided to represent each child in the family. At the point where the bride and groom light the central, unity pillar with their single tapers, the children join in and all participants are lighting the same pillar with their own flame.